A couple of years later, it was time to start going to school. I attended North Star Elementary, and from the very beginning, I loved school. Those hours of Sesame Street and Mr. Rogers, being read to and taught by my mother, had prepared me well. In mid-December of 1985, things were going about as well as they could for a five-year-old. After all, I was the oldest, going to school. 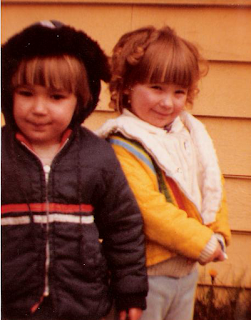 I was a hot-shot, for a Kindergarten kid (weren't we all?). My dad was in Las Vegas, working to earn money for the holiday, but that was okay since he'd be home for Christmas in a week or so. It must have been right after Turtle magazine had arrived in the mail, because I was in the bedroom of my parents, away from my pesky siblings, to read my favorite magazine. And then I heard my mother scream my name like I'd never heard her scream. And again. I'd never heard her say my name quite like that before. So I peeked out the door, entered the hallway. In a flash, I saw the smoke and my mother, her eyes wild, literally dragging my two siblings by a tangle of hair and arms. Before I knew what had happened, she had dragged me, too, and we were outside, across the street, watching our little yellow house being lapped up by smoke and flames. Hours later, when I finally emerged from the daze, I realized that the only thing I had escaped with was my clutched Turtle magazine. The newspaper, Anchorage Daily News printed a photo of the rubble along with a small caption reporting that firefighters had taken over 45 minutes to arrive on the scene, by which time the house was a total loss. It also noted that a woman and three children had escaped unharmed, and that two pet cats didn't make it. Fuzzy and Punky died in the fire. By the early 1980's, my dad had several years of experience in construction and was about as well-respected as one can be in that business: he worked for a contractor, hanging sheetrock on a number of the now-famous Las Vegas resort hotel and casino properties. Since Las Vegas is all about building up to tear down and build again, he rarely had a shortage of work. After awhile, he was doing well enough to upgrade our yellow VW beetle to a brand new, shiny, red Toyota Corolla station wagon. Perhaps it was the new car, the wanderlust, hippie nature of my parents not wanting to raise a family in Las Vegas, or something else entirely -- I was too young to ask and will never know for sure -- but after three years, they decided it was time to move on. Where? Somewhere about as climatologically different from the hot, arid Las Vegas desert as can be imagined. In the summer of 1983, we packed our bodies and a meager amount of material belongings into the station wagon and hit the road for Anchorage, Alaska. We rented a small yellow house on Cheechako St. Our yard was blooming with dandelions, "fuzzies," we'd call them when the season would change and the yellow flowers would turn to ripe-for-the-wind seed pods. We would purse our lips together and be like the wind, blowing the seeds off the stems, watching them lazy, drift on the air. Soon thereafter, we also got our first family pets: two cats, Fuzzy and Punky. Fuzzy was named, undoubtedly for her fur's resemblance to the "fuzzies" in the yard. She was either a poofy or a fat, gray cat with extraordinary patience for children. Punky was a sassy little calico kitten, thus named after our favorite colorful television personality, Punky Brewster. My mom was quite talented with a crochet hook and yarn, and she would watch us from the steps while making amazing things: dolls, ornaments for our tree -- snowflakes and snowmen and Santa's twelve reindeer, angels and elves -- for the upcoming holiday. Distinct memories of summertime: Fuzzy and Punky tearing after strands of yarn that my siblings and I would run around in circles in the yard of bursting dandelions. My dad continued to work in drywall, but Anchorage, Alaska wasn't exactly the fastest growing city in the US then, so he'd fly back to Las Vegas, periodically, for work. Three children and times were tough. My mother stayed at home with us. Days and nights were either long or short, depending upon the season. We had black garbage bags stapled to the windows, and I don't have much memory regarding sense of time or season on the indoors. During the harsh winters when the field of dandelions turned to white, days were filled with hours of PBS -- Sesame Street, Mr. Rogers -- and learning, reading, crayons and paper, being read to. We at a lot of Ramen noodles. 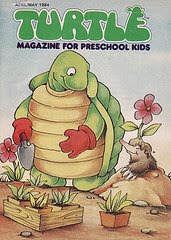 My first magazine subscription, Turtle magazine was had in the small yellow house. Every time a new edition came in the mail, I was thrilled. I loved staring at the words, trying to figure out how to pronounce them, what they meant. The periodic absence of my father was especially difficult for us, financially. Because he was in construction, a drywall hanger who worked for a contractor, he received no benefits or health insurance. Sometimes, when things were tough, my mom would take us to go stand in line at what I believe was the welfare office, though I can't be sure. It's strange how sometimes distinct memories can remain -- we were bundled up and up and up, until the layers of shirts and sweaters and coats and hats and scarves and gloves were deemed satisfactory to be subjected to the elements. The four of us would venture out into the cold, foggy Alaska morning with its eerie light, walking. My mom would have invariably packed hot chocolate and graham crackers for these trips, where we'd follow the streetlights and arrival meant we could finally open that warm hot chocolate, which was like steam from heaven underneath buzzing fluorescent lights.